With its cloth binding evoking a Jazz Age guide to speakeasies and its charming illustrations that could have come from a period magazine, this most influential cocktail book is reissued in a newly updated edition. Spanning the cocktail spectrum from classic to contemporary, it includes all the information the cocktail lover or mixologist needs to create the perfect drink in a stylishly retro package, making it an elegant, sophisticated gift as well as an indispensable companion for home or professional entertaining. 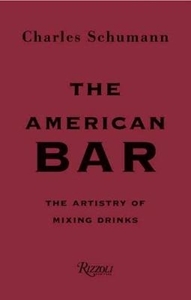 With 500 recipes and an easy-to-use index arranged by drink categories, this bar book is replete with fascinating stories behind the genesis of each cocktail, its creators, and component liquors as well as a guide to bartending equipment and a glossary of bar terms and measurements. Charles Schumann, whose appreciation of design and drinks is legendary, is the ideal guide to the perfect drink. Based on the menus at his iconic establishments Harry s New York Bar, then Schumann s American Bar, which later became simply Schumann's Bar each recipe focuses on quality and balance.